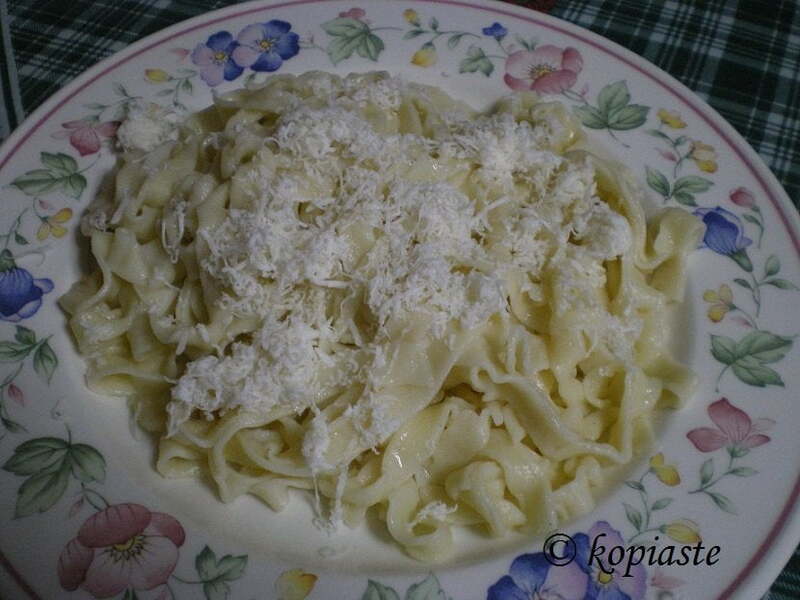 Makarounotes Chylopites (or hilopites) are traditional Greek egg and milk pasta. They are either cut long like tagliatelle and fettuccine or in very small pieces of about 1 cm long which are ideal as a side dish or in soups. Makarounotes are the long ones, which take their name after the word “makaroni”, which is a description of the long pasta to distinguish them from the smaller ones. They are usually cooked like any other pasta with myzithra on top, which is a local cheese for pasta and burnt local ewe’s or goat butter on top or in tomato based sauce dishes with meat (veal, chicken or lamb) as a side dish, or to thicken soups. Local products, which are easily found in supermarkets are usually taken for granted so most of us don’t bother to make them ourselves or even learn how they are made. Up to now I had never made them myself but like everybody else, I used to buy them from supermarkets. In fact the only thing I knew about chylopites is that the dough had eggs in it. Occasionally when we visited Sparta, we would buy and bring some along with us. You can find them in stores selling traditional products but we get them from a specific small local home business, where you can give them your own ingredients and they make them for you and you just pay them a small amount for making them. If you have time, they even dry them in their furnaces. Originally I was planning to post a dish I have prepared more than a month ago with chilopites and have not posted it yet. However, half way through writing the recipe I wanted to post, as I usually do I decided to find out more about chylopites. I searched the internet and could not find information about the ingredients used or on how they used to make them. At the time my husband was out, so the first person I thought to ask was my sister-in-law Rena. However, Rena had some memories from her childhood but didn’t know all the answers to my questions. Whatever she did not know she asked my mother-in-law, who by the way is 95 years old but her memory is as sharp as a blade and can still remember with details about the past and how they used to make them in their village Isioma, Karyon, Arcadias, Peloponnese. My mother-in-law, apart from having some minor health problems with her feet and cholesterol, is otherwise perfectly healthy and in fact until she was 80 -85 years old she would still crochet and never wore glasses in her life. She made all sorts of things, such as bed spreads, table spreads, curtains etc.. After making some for all her children, then she made some for her grandchildren as well. She has made for all of us hand crocheted blankets, table spreads, hand made lace and many other things. Many years back I used to consider them old fashioned but as I am growing older I seem to be appreciating them more and many of them I am using as props in my pictures. At the time I called, she was lying down and I didn’t want her to get up so that I would ask her directly. I asked my sister-in-law whatever I wanted to find out about and whatever she did not know, she would ask my mother-in-law. This is what I managed to learn from this conversation. During the years they lived in the village, and that was until 1960, all the women used to prepare their own pasta. They would usually make their chylopites during the summer – end of June till end of July, when they had plenty of eggs and flour, milk from their livestock, the weather was good for the pasta to dry and the children were at home to help. The women, friends and family, would arrange between them which day all of them would gather at someones house to make chilopites. In case the host was lacking any of the ingredients, as they would make large quantities, to last until the following summer, they would arrange to bring along some of the ingredients and the host would give them back another day. They would then rest for a couple of days and would arrange to go, all of them again, at someone else’s house until all of them had their round. Even the children would help during the procedure by fetching water fro the village’s fountain, or do other chores like watching out on the younger children or helping out whenever they were asked to do something but mainly they would help to cut the pasta into small pieces. Today, I was not planning to cook as I had leftovers from yesterday but after speaking on the phone I changed my mind and decided to make the pasta and consequently I will have this as the main theme for my post. I had already finished with the dough and was already rolling out the first piece when my husband returned home. I was so glad because it was already 1.30 and I had to hurry up as my daughter would soon be back from school and I needed some help. He soon came to my rescue and I began telling him about my previous conversation, while I was rolling out the pasta and he was helping to cut the pasta, he told me some things he remembered as well. He remembered the women gossiping and how much fun it was to have so many people around their house and the children would contest amongst them who would cut more and whose shape would be the best. He also remembered that on that day the children would not drink milk because it was reserved for the chylopites but the best part was that as a special treat at the end of the day, my mother-in-law reserved some dough and would prepare a dessert, similar to diples but as they did not always have honey, they ate them with sugar. My husband remembers that they made huge quantities to last until the next summer. Everything was hand made. They would roll out the phyllo by hand and cut them with a knife. They would spread them on tablecloths or sheets, somewhere to dry, so for some days all the tables, sofas or other surfaces were packed with chylopites. If those spaces were not enough to dry them on, they would put some sheets on the floor and would lay them there to dry for a couple of days. It was then their responsibility to toss them around during the drying process at least two or three times a day. When they had dried, they stored them in large linen bags, similar to pillow cases but even bigger, which they tied on top with a string, so that the pasta could breath and not spoil, to last until the next year. Of course, I did not make the quantity they used to do but I have cooked twice as much as I should and the rest we cut them into small pieces and they are on my table to dry for a couple of days. They are enough to make a couple or more dishes. While I was cooking them, my husband went to stir them and I could feel he was moved by the familiar smell and the memories they brought back from his childhood. His exact words were “That’s exactly how they would smell back then” and his voice had a small tremble. I am submitting this recipe for this week’s Presto Pasta Night, hosted by Ruth, of Once Upon a Feast and wishing her to have many more Presto Pasta Nights. In the mixer bowl put 2/3 of flour as well as salt and eggs and start mixing. Add milk gradually, until the dough is ready. If the quantity of milk is more than needed just add some of the remaining flour until the dough does not stick on to your hands. Cover with a clean table napkin and let it rest for half an hour. Take small pieces of dough and roll it out on the pasta machine. See detailed instructions in my video. I have rolled it on the attachment of my electric mixer gradually from number 1, to 5 and then number 8. Keep the rolled out sheets of phyllo covered so that it does not dry and when done add the pasta attachment which cuts the pasta into stripes. If you don’t have one, you can cut them with a sharp knife. Once the shredded pasta comes out you must dredge them immediately in flour so that they do not stick together. Place on a clean table cloth and cook immediately, otherwise if stored you will have to leave it for a few days to dry. Heat the chicken broth or boil water and add the salt. Cook the pasta for five minutes, stirring them occasionally as they keep floating. Drain and serve in a big platter on in individual plates. Grate lots of myzithra on top. In a small sauce pan heat the butter, which should be really hot. Pour immediately why very hot on top of myzithra. The amount of butter used is about 1 tbsp per serving. If you are serving them with a tomato sauce you do not add the butter. Mmmm…you bring back so many memories…when I was younger and we were in Greece I remember these being made at my grandmother’s place. Everyone got involved! Good on you for having a go Ivy…they look delicious. Never tasted anything like this Peter, very delicious. BTW I have never asked you from what part of Greece are you from? Ivy, I cannot tell you how much I love xilopites! I miss them so much. I’ve actually never tried to make my own pasta but I really want to so hopefully I will give these a try. PS, like the new look of the blog! If you can’t find them, try this Elly. They are much better than ready made ones and it’s not that difficult to make. Nothing beats eating homemade pasta (in this case Hilopites). It’s time to get that pasta machine. This is an amazing story “sis”. Now I know another reason why you should adopt me.Thank you so much for sharing your thoughts and this recipe as well with us all. I really need a pasta machine. I have never made pasta from scratch before, but I’d definitely start with this one. My parents are from Sparti…go the 300! This is Sparta…Parta (this is a local joke when Leonidas pushes Xerxes down Kaeadas! OMG Peter, I’m so excited that you are from Sparti that’s like my second home there, all my husband’s relatives live there in Sparti, Magoula, Klada, Amykles that’s where some of them live. Who knows, if you visit Greece we might meet there. Hi Ivy, what a wonderful story about the women gathering to make pasta. It is such a shame that it is not really done now. I bet they had great times and exchanged some great secrets during those pasta cooking days. PS Love the plate on which you have displayed your hipolates – it is very pretty. Ivy, what a truly lovely story. I do love it when people share not only a great dish but the snapshot of how it came to be…or it’s history. Thanks so much for sharing in the big Presto Pasta Night celebration and I hope to see more of your recipes in the roundups to come. Peter, I know I’m gonna make pasta more often now and it’s worth investing in a pasta machine, you too Ben, you can make so many things with it and it can last a lifetime. Sis, you are already adopted. Cakelaw, how wonderful it would be if we could get together with friends and share similar experiences. Ruth, I am glad I found your event. We eat a lot of pasta so you will definitely be hearing from me often. I also adore your plate which you present your hipolates on – so very beautiful. Hi Ivy. Wasn’t it great how things were done in the old times? There was time for everything, everybody getting involved… mmmmm so nice! This is comfort in a bowl!Thanks also for sharing this new event with us. We love finding about all these blogger events! Can you send me a plateful of hilopites? I’ve never made my own pasta before. Rosie, you won’t believe that I gave away the whole set of plates and platters because they were really heavy. I only kept six pieces. Hi Nuria, human relationships were much different and people used to help each other. Hi White on rice couple. I shall check out the video soon. Hi, A Scientist in the Kitchen, thanks for visiting and I wish I could cook for all of you. Until then the plate in the picture is for all of you. awwww..snif, snif, you made your hubby happy for all the hilopites memories… and wonderful recipe. Frankly, I didn’t know about this type of pasta… it’s so easy to make! So glad you post this recipe! Wow, great recipes. I love pasta and this looks amazing. Thanks for the sharing.